Call in to family at home while you're on the go. Your family can contact you instantly with the push of a button. See what's happening in your home, any time, day or night. Mobile notifications alert you when something happens. Lets you save 30 days of continuous indoor camera footage. Wide-angle lens plus HD resolution to catch all the action. Ping gives you a crystal-clear view of your home. Crisp, high-definition video catches every detail while a wide-angle lens opens up entire rooms. Advanced image technology lets you see what you want to see, day or night. It’s the next best thing to being there. See what’s been happening at home, at your convenience. When someone moves into Ping’s field of view, smart motion detection activates recording of 20-second Smart Clips you can watch on demand through your mobile device or Smart Hub panel. Plus, you can choose a specific area for motion detection and set the camera to be more or less sensitive to movement. Call in, call out. No cell phone necessary. Two-way talk gives you a direct connection to home from your mobile device. Check in any time to see to see if your kids are staying out of mischief, if they’re doing their homework, or just to say, “hi.” And your loved ones can easily reach you, too. Ping sends you custom mobile notifications about activity in your home, using your preferred settings to record video clips and send them to your phone. It’s an easy way to see people coming and going around your house and capture unexpected moments when you can’t be there. Kids wandering the house after bedtime. Pets that go bump in the night. Life doesn’t stop when the lights go out. But don’t get out of bed. Ping’s infrared night vision watches over your home from dusk to dawn so you can rest easy. Our Vivint Playback DVR service records a full month of indoor camera footage. Watch clips on your mobile device or Vivint Smart Hub panel, and share important moments with friends and family. From capturing baby’s first steps to figuring out who's been raiding the pantry, Playback makes sure you never miss a thing. One big (smart) happy family. Paired with the Vivint Smart Home app, Ping becomes a key part of your smart home. Set Pings by the front and back doors to function as motion-activated security cameras. As with everything in your Vivint smart home, it all works together to make your life easier. Paired with the Vivint Smart Home app, Ping becomes a key part of your smart home. Set Ping by the front and back doors as a motion-activated security camera. It can even alert the Vivint Smart Home monitoring center when an intruder is detected. 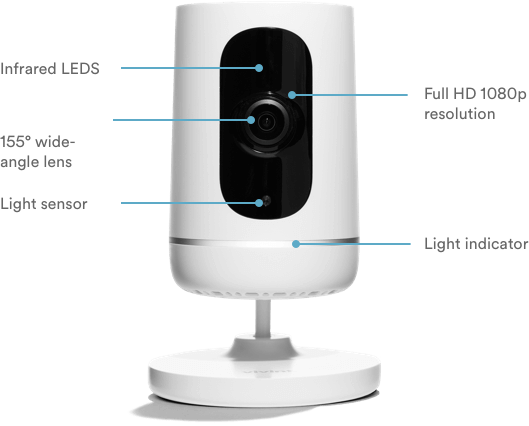 Ping is the indoor camera that’s always on the lookout because it helps to see what’s going on, even after dark. With its infrared night vision, Ping shows you if kids wander the house after bedtime, or if someone is prowling around while you’re on vacation. With Ping indoor camera, you’re always ready for unexpected moments. Smart motion detection activates 20-second Smart Clips when someone moves past Ping’s field of view when you’re away. Then watch on-demand from your mobile device or SkyControl panel whenever it's convenient. Save a full month of indoor camera footage with Vivint Playback DVR and watch video clips on your mobile device or Vivint SkyControl panel. Replay baby’s first steps, or discover who's been raiding the pantry, then create clips to share with friends and family. Our certified Smart Home Pros meet with you one on one to customize your smart home, install it for you, and make sure you know how everything works. You’ll avoid DIY headaches and costly mistakes with professional installation. And our job’s not done till you feel confident using your new smart home. Keep an eye out on your home with ping. How can I set up recording rules for my Ping camera? Set up your recording schedules online. here. What do I do if my recording schedules aren’t working? If your Ping camera’s schedules are not working, make sure your camera is functioning and the light on the front of the camera is a solid white. Next, check to make sure your schedules are turned on in the “recording schedules” section for your cameras. If the schedules still aren’t working after taking those steps, you may need to delete and recreate your recording schedules. Privacy mode allows you to temporarily disable your camera’s remote viewing and recording capabilities. While in privacy mode, your camera will display a blue screen on your online account and mobile app. What if my Ping camera isn’t showing up on my online account or my phone? Go to the cameras section in your online account center under Custom Actions. If you can’t see any cameras listed, contact our Customer Care team via chat for assistance. If you can see cameras listed there but not on your mobile app, log out and sign in again. The camera should then be visible. Can I install a new camera or move my old one? Camera height — Mount or position cameras according to your preference to catch the action you want to see. Signal strength — Make sure camera placement is within your WiFi range. Power supply routing — The closer to the power source, the better. Mounting — Ensure a secure attachment. Get a detailed list of steps. Learn more about current advancements in surveillance cameras. Read more tips on how to install security cameras. How to protect your home with cameras and more. A complete security system can help protect your home and family from a variety of threats—burglary, intrusion, property theft, vandalism, and house fire or flood—by facilitating quick access to emergency assistance. Vivint Smart Home provides you with a security ecosystem for your whole home—inside and out—as well as an on-call support team to assist you day and night. Outdoor Camera – Wireless, HD security camera with infrared night vision that gives you on-demand access to a live video feed and sends notifications to your phone when motion is detected around your home. Flood/Freeze Sensors – Protect homes from water damage and pipe-freezing low temperatures by sending mobile notifications when water is present or temperatures drop. Motion Detector – Infrared motion sensor with 90-degree look-down to ensure nothing passes by undetected. Smoke Detector – Uses photoelectric sensing to detect when smoke is present. Door/Window Sensors – Sound an alarm whenever protected doors and windows are opened and can also be used to protect medicine cabinets, gun cabinets, or the door to a child's bedroom. 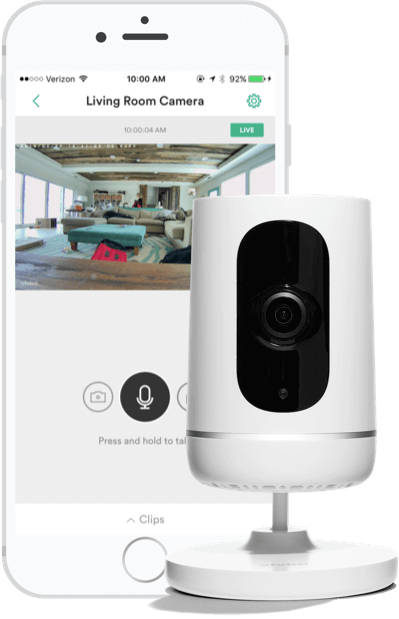 The Vivint Ping Camera is an invaluable addition to your smart home package. Ping gives you visual coverage inside your home and easy, two-way communication with the people who come and go when you’re away. Learn more about how to protect your home.